I started writing this review (in my head) at about the 50% mark and it hasn't really changed all that much. Unfortunately. I finished this book because I was hoping that it would end better than it did and because I did care about both of the main characters. I wanted them to have a happy ending. I needed it for them. While they did get it, I don't think enough questions were answered before the "I Do's." To be honest, I'm pretty sure that the only reason i requested this book from Netgalley was the fact that it is a second chance romance, which we all know is my catnip. 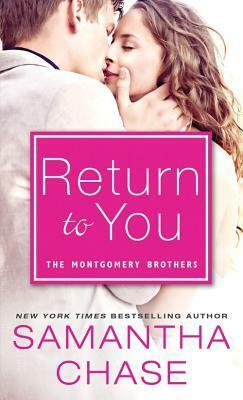 Return to You is the fourth book in the Montgomery Series--something I did not know until I already started reading it. From what I can tell, each book is orchestrated by William Montgomery, who fancies himself a matchmaker. In this book, he has set his sights on his nephew, James. James Montgomery is a cop in Long Island, working out of a precinct in Smithtown (let's put aside the fact that I'm fairly certain that most of Long Island has sheriff's departments and not actual precincts). When he was 20, James left the family fold and struck out on his own because he felt as if his father didn't respect him. All he wanted to do was be an agricultural designer and was working his way up to that goal when he met Selena Ainsley. She was everything he wanted and surprisingly she felt the same way as him. Sadly, tragedy struck and the two spent the next 10 years apart because of machinations of people with ulterior motives. In those 10 years, James has gone from a young man with a chip on his shoulder to a 30 year old Detective with a chip on his shoulder, and Selena has held herself apart from everyone that mattered to her before she and James broke up. While she has created a successful event planning business in North Carolina, she's not happy and wonders what happened to the boy she loved and why he wasn't there for her when she needed him most. As I said above, I really liked both of these characters. They were compelling, complex, and sympathetic characters, but they deserved better than this book. For the first 30% of the book, Ms. Chase indulged in so much head hopping that I nearly had to step away from the book. Scenes between characters constantly switched POV and when there were more than 2 people in a scene this was very confusing and got to the point that I had to read whole sections of dialogue again to make sure I understood it. It was truly bizarre, as if that section was not edited at all because once we got past that point, there wasn't all that much head hopping. It still happened every once in a while, but not to the extent it had in the beginning. I also did not like the matchmaking element. A big part of the plot involved both Selena and James feeling as if they weren't in control of their own lives and the matchmaking thing only made me feel as if they didn't have a choice even in this. Everything was orchestrated by his brother, uncle, and her best friend because they all knew what was right for them better than they did. Plus, it was completely unnecessary. The only thing that William really did was pay for Selena's high school reunion, but even that could have been handled without his intervention. (Jen, Selena's bff, claimed that there wasn't enough money to have the reunion, but reunions have been planned without a rich benefactor, paying for everything. Hell, my high school closed down a few years ago, but it didn't stop the alumni from having their own 10th High School Reunion last year.) Also, Jen could have gotten her to town to plan the reunion without William suggesting it. Personally, I am not a fan of the matchmaking trope, especially in a contemporary romance. It needs to be done really well and in this case, it wasn't. Finally, the ending was too pat and failed to actually deal with Selena's issues with James. They were real, legitimate issues, but they apparently disappeared once she saw him again and realized that he wanted to marry her. What they needed was to talk things out. James needed to explain why he hid so much of himself from her, but he never did. There was a kitchen quickie, fancy food, and an engagement ring, but there was no conversation. I don't understand why Selena can suddenly trust him again. It just doesn't make sense.